You have the choice between 174 air-conditioned rooms, boarding house apartments, suites and family rooms for up to four people. All of them are lovingly set up for you. Aside from all the comforts of a superior four-star hotel, we offer a complementary tea and coffee bar, high-speed WiFi, Sky TV with a USB / HDMI interface for multimedia devices and an in-room safe. Your small pets are very welcome. 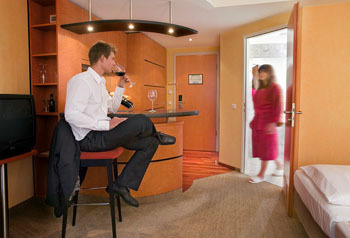 For smokers, we offer a few guest rooms in which smoking is allowed. these are 24 sq meters in size and come with a sitting area, a large desk and a spacious bathroom with shower. 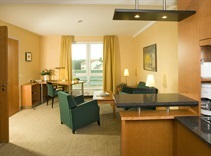 with the same equipment and size as our standard rooms, these rooms additionally feature a view of our conference garden. these are 28 sq meters in size and come with the additional features of a chic bar, a kitchenette and a comfortable sofa. 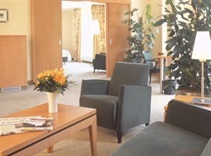 the same as the superior rooms in terms of size and amenities, these rooms additionally offer a view of the conference garden. These offer comfortable living amenities for up to four people. They are ideal for a family holiday or a Berlin trip with your best friends. these are 48 sq metres in size and come with a kitchenette, a living room, a bedroom and a dressing room. Enjoy comfortable living in 80 sq metres with a bedroom, a living room, two flat-screen TVs, a large bathroom with two washbasins, a shower and a bath tub as well as a dressing room.